The disconcerting ability of bacteria to evade death from treatment with antibiotics is achieved with two distinct strategies, resistance and tolerance. Resistance occurs by a variety of mechanisms, including drug efflux and/or preventing the drug from binding by modifying either the drug itself or its target. Tolerance, on the other hand, is a characteristic of a subpopulation of normal cells known as “persisters.” This phenomenon was first described by J. W. Bigger in 1944 who found that some members of a population of Staphylococcus aureus survived treatment with penicillin. Pathways leading to tolerance have been studied extensively in Escherichia coli, where they have been shown to be highly redundant and therefore hard to combat. At long last, the work of Lewis and collaborators suggests that a combination of antibiotics mat be the answer to this mode of bacterial defense. Here’s how persisters arise: given that most antibiotics work on growing bacteria, slowing down their metabolism will make them insensitive to the drugs. Normally, a small proportion of cells in the population spontaneously enter a state of reversible dormancy. Commonly, this is thought to take place through the action of toxin-antitoxin modules. An example of such a mechanism relies on the activity of the HipA toxin, a kinase that phosphorylates a glutamyl-transfer RNA synthetase. This leads to the overproduction of the signaling molecule (p)ppGpp and the activation of the stringent response, which shuts down the synthesis of about 1/3 the genes of the bacterium and thereby leads to dormancy. But there are other dormancy pathways as well and their multiplicity makes finding a drug that inhibits the development of persistence a futile task. Thus, researchers have recently turned their attention to the search for agents that would “corrupt” a target in persistent S. aureus cells located within a biofilm. Before discussing the paper in question, note that the theme of persistence has been often linked to that of biofilm formation. This is appealing because bacteria in biofilms often become insensitive to antibiotics, ergo can turn into persisters. Many chronic infections have been shown to involve biofilms, including osteomyelitis, endocarditis, deep-seated infections of soft tissues, gingivitis, infections of catheters and other indwelling devices. Particular attention has ben paid to the emergence of persisters in Pseudomonas aeruginosa biofilms. Figure 2. ADEP-4, a synthetic derivative of the natural acyldepsipeptide antibiotic ADEP. Source. A novel family of antibiotics known as acyldepsipeptides (ADEPs) produced by Streptomyces hawaiiensis were deemed to be candidates for anti-persistent therapy. The mode of action of these drugs is quite novel, at least to me. The likely reason is that this class of antibiotics has not seen the light of clinical day because bacteria rapidly become resistant to them. No matter, their mode of action is unique. They work by opening the pore in the molecule of the nearly ubiquitous Clp protease. This normally narrow and selective channel in the ClpP subunit of the enzyme permits slender unfolded protein molecules to enter, leading them to destruction. Enlarging the pore turns the enzyme into an omnivore that is able to degrade many proteins normally impervious to its activity, with dire consequences for the bacterium. Would these drugs work with non-growing bacteria and induce them to commit suicide? The researchers in the Lewis lab exposed stationary phase cells of methicillin-resistant S. aureus (MRSA) to a more potent synthetic ADEP derivative, ADEP4, for a prolonged 24 hours and examined the resulting proteome. Of 1,712 proteins (65% of the predicted open reading frames) detected in control cells, 417 were degraded in the treated cells. Among the most frequent casualties were ribosomal proteins, FtsZ (which forms the cell division ring), and enzymes involved in purine metabolism, glycolysis, and aminoacyl-tRNA biosynthesis. Figure 3. Model of biofilm resistance based on persister survival. An initial treatment with antibiotic kills planktonic cells and the majority of biofilm cells. The immune system kills planktonic persisters, but the biofilm persister cells are protected from host defenses by the exopolysaccharide matrix. After the antibiotic concentration drops, persisters resurrect the biofilm and the infection relapses. Source. Figure 4. The proteolytic subunit of Clp, ClpP forms a ring-shaped barrel with a small pore (amino acids lining the pore are shown in red). The pore is normally gated by ClpP-associated ATPase enzymes, which control the entry of protein substrates into the ClpP chamber. ADEP molecules (purple) bind to the ATPase docking sites on ClpP, causing a conformational change that widens the pore, leading to deregulated protein degradation. Source: (1) and (2). These proteomic data suggest that ADEP4 forces self-digestion of many of the cell’s proteins (should we call this bacterial autophagy? ), which is what could lead to the killing of dormant cells. Even better, when ClpP is stimulated by ADEP4, it no longer requires ATP for its activity. This makes it an ideal agent for eradicating persisters since they have low energy levels. But what about resistance? When ADEP4 was added to a stationary culture of S. aureus, the culture recovered after 3 days due to a high frequency of null clpP mutants. This could be overcome by a combination of ADEP4 and rifampicin, which led to the complete killing of a stationary population. Surprisingly, null clpP mutants when in stationary phase were found to be extremely sensitive to antibiotics such as rifampicin. With these encouraging results with combined therapy at hand, the team tested a biofilm formed by an S. aureus strain associated with osteomyelitis. ADEP4 showed considerable killing initially, although the cell counts rebounded after 72 hours. Once again, a combination of ADEP4 and rifampicin led to the complete destruction of the biofilm, an unprecedented result for clinically feasible concentrations of drugs. Yes, But What About In Vivo? Figure 5. Conlon et al. show that the combination of ADEP4 and a conventional antibiotic kills non-growing persister cells—the small, slow-growing population of cells that persist during treatment with conventional antibiotics (alone or in combination). Source. All of the above studies were done in vitro. The researchers now focused on a mouse thigh infection model. The mouse is first made neutropenic with cyclophosphamide, then a large dose of the pathogen is delivered to the site and the infection allowed to proceed for 24 hours before starting therapy. This model emulates a difficult-to-treat human deep-seated chronic infection in immunocompromised individuals. Histological cross sections of the infected area showed biofilms of S. aureus adhering to muscle cells. Administration of vancomycin, rifampicin, or a combination of both, decreased viable counts but did not clear the infection. In addition, no significant difference was observed between mice treated with vancomycin for 24 or 48 hours, suggesting the survival of a persister subpopulation. A combination of ADEP4 and rifampicin resulted in sterilization of the infected tissue within 24 hours. Furthermore, a hollow-fiber experiment, which utilizes a perfusion bioreactor within which a tissue-like mass is simulated, showed that this combined therapy led to complete elimination of the pathogen. Figure 6. ADEP4 kills a S. aureus biofilm and in combination with rifampicin eradicates the population. Source. Although persistent bacteria have not received the attention given to antibiotic-resistant strains, these notoriously recalcitrant cells hamper our efforts to treat chronic infections, especially those caused by biofilms. CDC estimates that approximately 70% of all human infections involve biofilms, a startling statistic that highlights the importance of the problem. The current study demonstrates the efficacy of “corrupting a target” in S. aureus persisters as a means of killing these drug-tolerant cells. In this case, ADEP4 activates the protease ClpP and causes it to become a more promiscuous enzyme, resulting in self-digestion of the bacteria’s proteins. Although null clpP mutants of S. aureus occur frequently and results in resistance to ADEP4, these cells fortunately exhibit enhanced sensitivity to other antibiotics. Therefore, administration of ADEP together with rifampicin leads to complete eradication of a stationary phase population or of a biofilm. The therapeutic strategy employed here can be expanded to other targets in different pathogenic persisters, thereby heralding a promising new era for the eradication of these troublesome bugs. 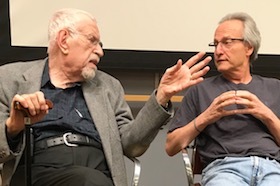 S. Marvin Friedman is Professor Emeritus, Department of Biological Sciences, Hunter College of CUNY, New York City and an Associate Blogger for Small Things Considered.